A growler with style! Your friends will be impressed before you ever crack the lid. 'What is a growler?' you ask - typically it is a plain 1 gallon glass jar with a screw cap that is used to store, move and serve your draft beer. The growler is filled from the tap (we suggest filling a cold growler from the bottom with a section of 1/2" id tubing connected to your faucet) and then transporting to friends. This is much easier than moving a whole keg, and it limits your friends consumption of your homebrew! 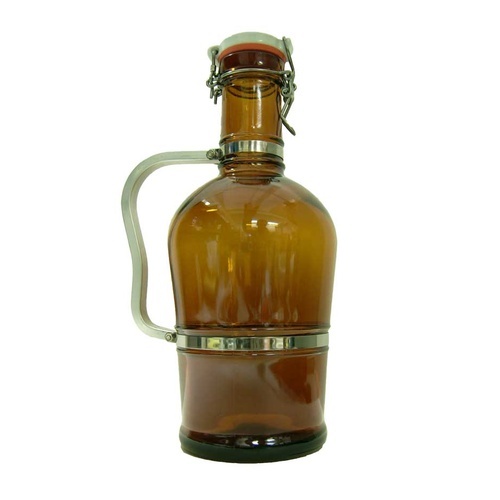 This ancient looking, german-styled model, is certainly the Rolls Royce of growlers. Have you ever ridden in a Rolls Royce? I haven't, but I imagine this growler will deliver you that same type of high-roller experience without those annoyingly spendy maintenance costs. A #10 Stopper fits in the opening. These things do look nice and are very easy to pour from. Those are the pros. The cons are evident when putting in a cooler. Due to the handle and narrow neck (wasted horizontal space), they take up more room in a cooler and are subject to breaking. I have stacked a bunch of ice and plastic water bottles between them. Hence, wasted space. I have about 15 of them now, not including four broken ones. These are great if you only need one or two, especially if you have the space, ie a fridge or iced cooler. I will continue to use them for special occasions, but mainly use the double wall stainless steel ones for the cooler/transport. The quality of this item is in line with its price. It is expensive, only buy if you plan to use it a lot. I have 4 growlers, 3 different types. This is definitely my favorite. The nice, large handle makes transporting this growler much easier (and safer). This is a nice growler, but expensive. I gave it as a gift, since the plain growers with screw on lids work just fine. Worth the $ I guess if you're looking to make an impression with your vessel.